Two bronze-colored toads sat on a rock catching flies and mosquitoes with their long, sticky tongues. After doing this for a few hours, they began to get fidgety. "This is boring," the largest toad, Weston, croaked. "Let’s say we have a leaping contest, although it wouldn’t be much of a contest. You know, and I know, that I can leap higher than any toad in Scotland." "I hate to differ with you, Weston, but I can jump higher than you can," Warren, corrected. He leapt from the rock into the air, flying a few yards. "See!" "Is that as good as you can do?" Weston asked, scoffing. "I’ll bet you can’t jump over that rose bush." "Oh yeah! Watch this," Warren said. He jumped. He sprang over the rose bush, feeling the soft, velvety petals brush his moist skin and he passed over them. He landed with a plop back on the spongy, amber-colored moor. He turned around and grinned at Weston. "See," he smurked. CROAK! CROAK! "Well, that was easy. Anyone can leap over a rosebush. It’s not that tall. Let’s see you jump over that highland cow," Weston challenged, pointing to a rusty-colored cow that was standing by a clump of thistle, munching away contentedly. Warren took a few small leaps then jumped. He flew over the cow, feeling its scratchy fur as he passed overhead. "Wheeeeee," he called out, giggling. When he landed in a puddle on the other side of the cow, he started laughing. "Heh, heh, heh, heh, heh. I told you I could do it." Weston wasn’t happy. He didn’t think that Warren could jump that high. "Well, that still was easy. I’ll tell you what. I’ll show you who is the best at leaping. I’ll jump over that boulder over there," Weston said, pointing with his long finger. CROAK! CROAK! Warren looked at the boulder. "Hmmm, that’s a big boulder, Weston. CROAK! Do you think you can do it?" "Of course I can. You jumped over that small highland cow. I can surely jump over that huge boulder," Weston assured his friend. He swung his body back and forth, preparing for the jump. "One, two, three," he went, and flew threw the air. He landed with a thud on the other side of the boulder. "Whew!" he whispered to himself, relieved that he had been able to do it. The two toads kept challenging each other, and the objects kept getting taller. Warren leapt over a smallish blue spruce. Weston jumped over a big-leafed oak tree that was heavily laden with acorns. Warren hopped over a bear as it was getting a drink out of the river. Weston, sprung high and flew over an elm. He got a few splinters in his legs from brushing over the branches. The dares kept getting bigger, and bigger, and were becoming much harder for the toads to jump over. Weston was also starting to get tired. That last elm tree had been a close call. He’d almost not made it. It had taken an hour for him to pull all the splinters out. He knew if he wanted this to end, he’d have to find something so big that Warren couldn’t possibly jump over it. 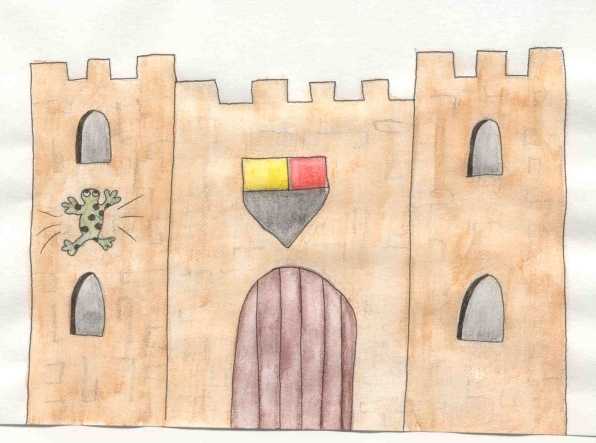 "Aha, I’ve found something I know you can’t jump over, MacLeap Castle," Weston challenged his toad friend. Warren looked at the castle. It was big. It was so big that he didn’t think he’d ever be able to leap over it, but he had to try. "I think I can do it," Warren boasted nervously. "It isn’t that big," he gulped. He let out two loud croaks, and started rocking back and forth. Faster and faster he rocked until he felt he was ready. He leapt through the air with all of his might. He made it about halfway up the side of the wall of the castle, saw that he wasn’t going to make it over the top, and watched as he closed in on it. SPLAT! He hit the side of the castle wall. He just lay still, plastered against it and then began to slide down the bricks to the sand below. Weston watched Warren. Somewhat frantic, he hopped over to his friend, who lay silently at the bottom. Weston poked his friend. "Warren, are you all right?" he asked. Warren opened one of his eyes. "Maybe you can jump higher than me," he admitted. He lay there for a little while then got up. "From now on, the biggest thing I’m going to jump over is you!" From that day on, Warren and Weston could be seen hopping and splashing around on the bog. But they weren’t challenging each other any more. Instead, they played a fun, and very safe game of leapfrog. CROAK! CROAK! CROAK!